College dance programs are gaining in sophistication, and the panel discussion on August 29, 2015 was designed to deliver the inside information our dancers need for a competitive edge. Six highly esteemed dance educators participated in this important discussion on the advantages, options and opportunities offered to college bound dancers. 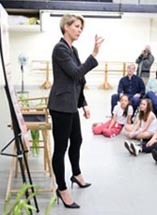 Jenna Elfman recently launched our “Dance Talks” series. It was a great success and we thank Jenna for participating. Update: Right after her talk, Jenna gave this interview on Rich Girl TV, which you can also watch on YouTube. She gives some great advice and discusses her experience at Westside Ballet.